ROCKVILLE, Md., Nov. 9, 2017 — The Clarion hotel brand awarded the 2017 “Meet Me at Clarion” contest prize to Army veteran Brent Wilsonfrom Chippewa Falls, Wisc. The prize package includes a group getaway to the home of country music, Nashville, Tenn., to attend the Country Music Association Awards. 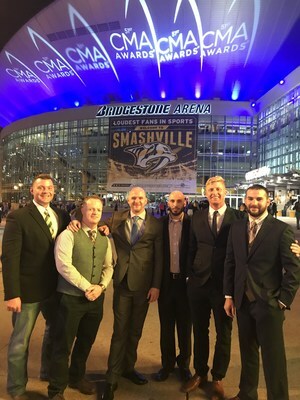 As this year’s winner, Wilson and five friends received a three-night stay and invitation to a VIP event at the Clarion Hotel in downtown Nashville, round-trip airfare, and a personalized Nashville experience – including a private tour of the Jack Daniels Distillery and famous country music honky tonk establishments – culminating with tickets to attend the 2017 Country Music Association Awards show on November 8, 2017. In his winning entry, Wilson described the brotherly bonds formed during “a fairly rough” deployment that saw many painful losses. He added that he and his fellow platoon members had not been together for more than a decade. But, he hoped that winning the Meet Me at Clarion contest would help to bring them back together to celebrate their love of country and country music. With onsite bars and restaurants, meeting space and convenient amenities, Clarion hotels are an ideal option for social and business gatherings, which reinforces the brand promise that Clarion is the hotel to Get Together Here. Chat. Laugh. Reconnect. We’ll see you at Clarion.